Dazzling white sands, sea gently lapping on the shore, lush green forest as a backdrop. No, we’re not in the Maldives. We’re at Aksazlar Beach in Fethiye. 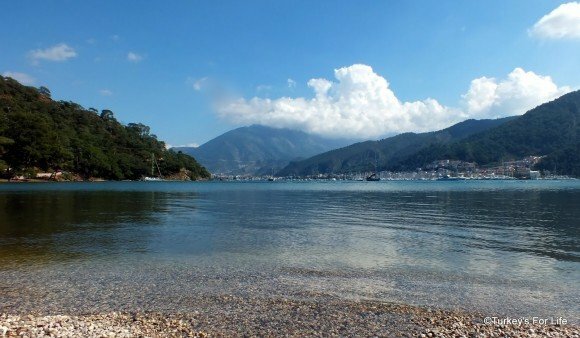 A few years ago, whenever people came to Fethiye for a summer holiday, the general assumption used to be that if a day at the beach was in order, they needed to jump on the Fethiye Çalış water taxi to Çalış Beach or take the dolmuş over the hill to Ölüdeniz. The local bays were often overlooked. Well, all that has now changed and the ‘beaches’ around the Fethiye peninsula (yarımada) are very much making a name for themselves. Aksazlar Bay has always been a part of our lives in Fethiye. Originally just a forest clearing with a few picnic tables, we, along with a good number of other locals would set up there on winter and autumnal Sunday afternoons. Barbecues and picnics galore. 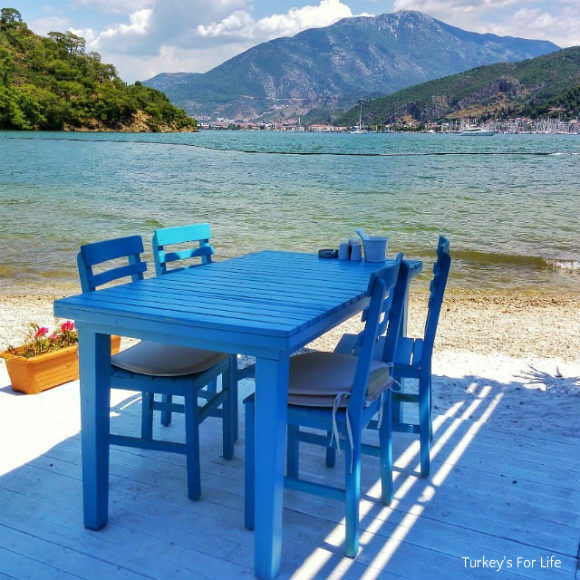 The forest setting and the views back over the bay to the Karagözler and Fethiye centre – all watched over by the surrounding hills and mountains – of course those long barbecue afternoons at Aksazlar are happy, happy memories. Since those days, Aksazlar Beach was put out to tender and, over the years, different people have taken charge with varying degrees of success. Right now (this is an updated article – July 2018), for us, Aksazlar is at its best. Yes, around the peninsula, many of the bays are now known as beaches. As with Help Beach & Yacht Club and neighbouring JJ Beach Park, gone is the shingle and stone from the forest floor. In its place is imported sand. 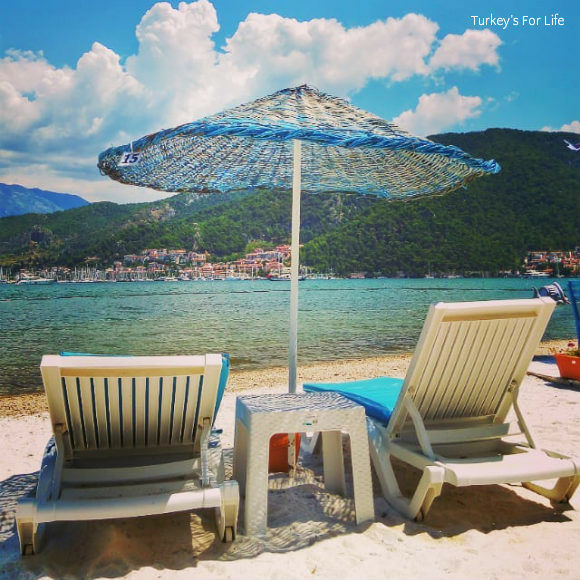 At Aksazlar, what has been laid is a glistening white sand made of quartz – and that keeps the feet cool. No more are those moments where you find yourself in a no man’s land in the middle of the beach, soles of your feet on fire, tip toeing as fast as you can to the water. Whilst we have mixed feelings about the sand introduction around these bays, there’s no denying that strolling along the seashore with a cooling sand between your toes is a lovely feeling. That’s what we did a few weeks ago when we went to Aksazlar with friends who were over on holiday. We hadn’t been to the bay for some time – not since the new management had taken over. Time to give it a go and also show our friends why we love the views from Aksazlar so much. Aksazlar is also easily accessible for those of us who rely on public transport. We didn’t want to go too far that day, we were only out for an afternoon and so this beach was the best option. The Taşyaka-Karagözler dolmuş goes there every few minutes and it’s only around a 20 minute journey from the main road at the dolmuş station in town. We were soon being greeted with smiling faces as we wandered towards the sunbeds and that famous cooling sand. Regular readers will know we are not the best sunbathers in the world. 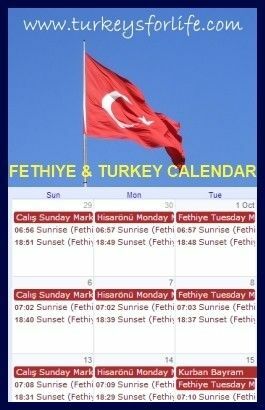 It was early June so the Fethiye weather wasn’t too stifling but, still, it wasn’t long before we got fidgety on our sunbeds. Instagram is awash with photos of swings – swings over rivers, swings in the forests, swings in the countryside and swings in the sea. We knew a swing had been introduced at Aksazlar so, after deciding enough was enough with this sunbathing malarkey, I took myself off to the swing. The aim was to take a photo and make our contribution to the Instagram swing collection. I did do that. Oh but then I also just had to have a little go on the swing, too. Back and forth, enjoying those Fethiye views, feet trailing through the water – there are worse ways to spend an afternoon. And once I’m up and about and mooching around, settling back down to sunbathe never happens; especially when there are seaside tables in the shade to be made use of. I made this little shady corner my home for a couple of hours or so whilst having a read and a strawberry ice cream milkshake. There is more comfortable cushioned seating for lounging around on at Aksazlar – I just liked it here. 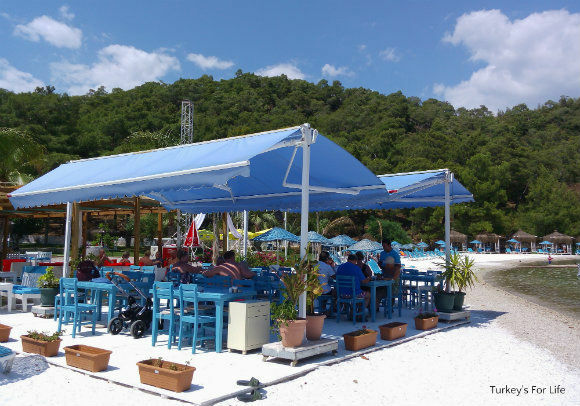 As well as sunbeds and umbrellas, there are shaded köşks, too, that you can rent for the day. There’s even one in the water, as you can see in the second photo above. Around the beach bar, under shade, there’s also wide cushioned seating where you can make yourself comfortable and enjoy drinks with friends. And that’s what we did – of course. There’s something really relaxing about sitting in the shade of the encroaching pine forest, watching the yachts come and go in the distance, enjoying the cries of the cicadas as they bask in the pine trees under the hot Mediterranean sun. And really, that’s what we like to do at Aksazlar Beach. Because of the bay’s location, if you’re expecting crystal clear turquoise waters of the Turkish Mediterranean, you’re going to be a bit disappointed. It’s a shallow bay and once you get past the stones, the sea bed below you is smooth and muddy as opposed to sand or shingle. People do swim here – there’s even wheelchair access into the water – and if you don’t like crowds all around you when you’re in the water – and you like your sea to be calm – happy days. For us, though, if we’re looking to swim, we head elsewhere. 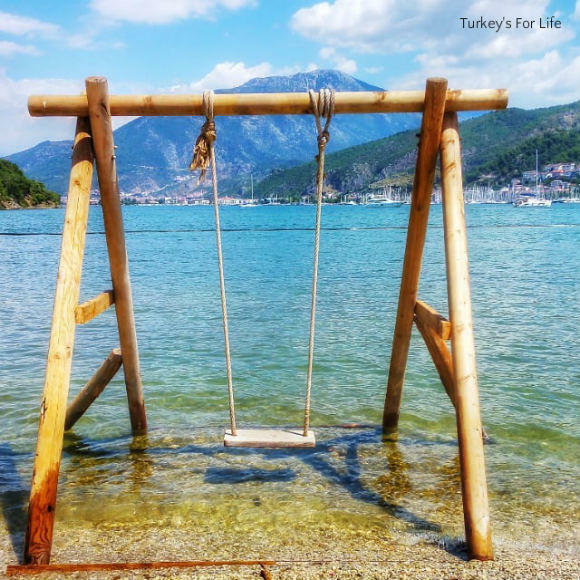 Aksazlar is our favourite place to chill and take in the views of Fethiye – oh, and paddle our feet whilst sitting on the swing. These days, Aksazlar Bay is actually known as Leb-i Derya Aksazlar. Leb-i Derya is an Ottoman Turkish phrase – ‘leb’ means ‘lip’ and ‘derya’ means ‘sea.’ It refers to the shoreline where the sea meets the land – and sounds much more poetic than its English translation, we’re sure you’ll agree! 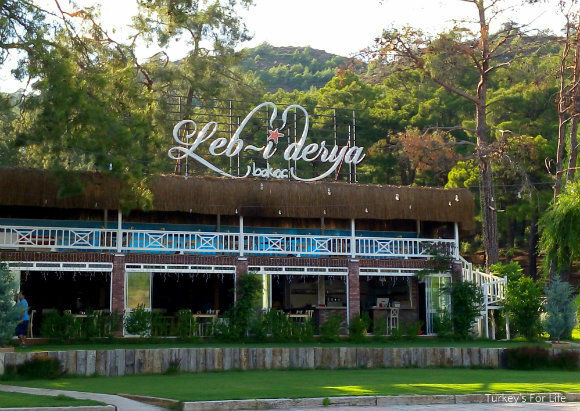 Leb-i Derya is the name of the restaurant at the beach and Aksazlar is the original name of the bay. It means, while you’re there, chilling on your sunbed or in a köşk, you can also browse the varied menu and order a snack or something a bit more substantial. We didn’t eat, as such; just ordered a ‘beer plate’ (all the rage in Turkey, these days) to share and keep the hunger pangs away until it was time to leave. So, we can’t really comment on the food at Aksazlar but people we’ve spoken to have enjoyed it as part of their day at the beach. Honestly, a ‘beer plate’ cannot really be described as haute cuisine. Guess the clue’s in the name. We’re talking a few frozen chips, mini hotdog sausages, onion rings, cheese pastry rolls; that sort of thing. A plate of beige! But perfectly tasty to nibble on when sat with friends. And the beer plate at Aksazlar did have a couple of little extras on there, too. Chicken goujons, some battered seafood and prawn crackers. Aksazlar is just off Fevzi Çakmak Caddesi, between Marina Boutique & Nidya Hotel and the lovely Club Letoonia Fethiye. The Leb-i Derya menu has a good choice and meals are reasonably priced. Aksazlar Beach plays host to weddings, parties and live music events so keep an eye on their Facebook page for any events. To get to Aksazlar Beach by dolmuş, take the Taşyaka-Karagözler dolmuş. Tell the driver you are going to Aksazlar and he will take you all the way down to the bay. 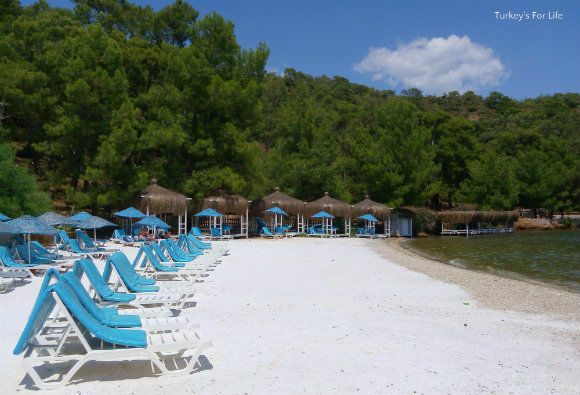 For a mapped location of Aksazlar Beach and other beaches around the area, take a look at our list of beaches around Fethiye and beyond. @ Alan: Aksazlar probably is your sort of place as it’s very quiet. The front area is a bit developed but the beanbags and the campsite are lovely. Hi K Blair. Thanks a lot for your comment. We display the date on all our posts for the benefit of our readers. If you look at the post date and the date of the comments, you will see this post was written about Aksazlar Bay 5 years ago in 2012. Things change. We intend to update our Aksazlar post very soon as we know management of the bay has changed. We only write about our own personal experiences on this blog so we won’t update until we visit again. For good or bad, a few of the beaches around here now have DJs and live gigs. Hi. What is the cost of renting two sun loungers and a sun umbrella? Hi Constant. At the moment, two beds and an umbrella at Aksazlar is 20TL.